Since 1988, home and business owners throughout the Spartanburg, SC; Greenville, SC & Anderson, SC areas have relied on Spartan Paving and Concrete for all of their paving and concrete needs. We provide our customers with long-lasting, durable results at competitive rates. For nearly three decades, we have grown to be a leader in the asphalt paving and concrete driveways business, and we continue to deliver superior services to our customers. As your full-surface concrete and asphalt contractor, we perform excavation, grading, forming, paving, pouring, finishing, and repairs for a multitude of asphalt and concrete surfaces. A damaged, faded parking lot or driveway can be a real eyesore that diminishes your property’s curb appeal. It’s time to improve the appearance of your exterior and have your surfaces resealed, repaired, or replaced by our team. Why choose Spartan Paving and Concrete? Our locally-owned-and-operated paving company is licensed and fully insured to protect our employees, as well as your property. The level of dedication and care that we exemplify has resulted in our company earning an A+ rating with the Better Business Bureau. Additionally, we’ve been named one of the top 10 concrete contractors and paving companies in Spartanburg County, SC by the Prime Buyer’s Report, in recognition of our superior standard of service and our high customer satisfaction rate. Spartan Paving and Concrete began in 1988 as a seal coating and asphalt driveway contractor. In 1995, we expanded our business to include concrete installation, site preparation, pouring, and finishing. With our continued success, we began to offer decorative concrete services to our customers in 2003, with stamped concrete, colored concrete, and stained concrete options. 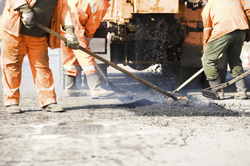 We provide quality concrete and asphalt services at an affordable rate for our customers. Upon providing you with a cost-free, no-obligation estimate, we’ll answer any questions that you may have about our processes. Our costs include charges based upon the materials used, permits, labor, and taxes. We’ll keep you informed every step of the way, ensuring that our services exceed your expectations. For experienced, reliable concrete and asphalt paving, repairs, and maintenance, trust in Spartan Paving and Concrete. We have the experience to complete each project with efficiency and precision. Aside from our asphalt and concrete paving services, we can competently complete a multitude of other services, including filling and creating sidewalks, pool decks, and patios. We provide seal coating to protect your surfaces from weather damage and wear and tear. We also offer repair work to existing concrete and asphalt surfaces, providing crack filling and patch work. Our paving process begins with us marking out the work area, which we then prepare by removing and hauling the old concrete, asphalt, etc. away. After we pour the desired surface material (concrete or asphalt), we will ensure that it is completely leveled and that the edges are straight. We’ll ensure that the process is properly completed, making certain that the finished surface looks beautiful. Your satisfaction is our top priority. Our Spartan Paving professionals specialize in asphalt paving and seal coating for driveways and parking lots. We offer new surface paving, repaving, resurfacing, crack filling, striping, and more. Having your asphalt surfaces properly sealed after they are paved is crucial to their longevity. Seal coating prevents wear and tear from normal use, storm damage, and from the harsh heat exposure of the summer months. There is no better way to optimally protect your asphalt paving than with seal coating. Our seal coating services are designed to seal and protect your asphalt surfaces from damaging forces. Seal coating will provide a jet-black finish with a rich appearance of a new surface. We recommend having your asphalt driveway or parking lot seal coated within six months of installation to prevent deterioration from water, gasoline spills, oil, and other harmful substances. The professional contractors of Spartan Paving and Concrete provide reliable concrete construction. We perform installations, crack repairs, and repaving for driveways, walkways, sidewalks, patios, pool decks, ramps, and slabs. 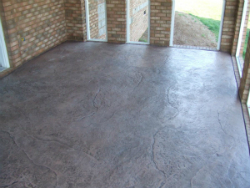 We also offer decorative stamped concrete, colored concrete, and stained concrete to enhance the appearance of your property and increase its value. We can design and implement a beautiful backyard oasis for your home with a stamped concrete patio. Our skilled contractors have completed patio projects of all shapes, sizes, and complexities. We’d be happy to create a patio for your home. Do you have concrete driveways that need to be replaced? Are you looking to have your faded and worn parking lot seal coated? We are your premier provider of concrete and asphalt services in Spartanburg County. Call 864-256-3258 to schedule your next asphalt or concrete paving project. As a full-service paving company, we have completed a variety of projects, ranging from parking lot tear-outs and replacements to stamped patio construction. We offer free estimates and are fully licensed and insured to complete your projects.